Our choice to either “bless or curse” Israel and the God of Israel determines our fate, as individual and as nation. God’s purposes for His universe are righteous and eternal. He accomplishes them upon earth through humans that are chosen and guided by Him. In the days of Samuel the Prophet, King Saul was rejected, and David the son of Jesse was chosen. Some people in Israel did not like that choice… In fact, a civil war was fought over it, but it was God’s will that the crown go to David. We can read about this in the book of 1 Samuel. Discerning God’s will and agreeing to obey it is important for everyone. Those who fought against David for purely political reasons found themselves fighting against the Lord. Having respect for God’s choices means choosing to be on God’s side. Having a relationship with God means learning to love what He loves, and learning to choose what He chooses… The Bible makes it clear that God has chosen Israel for His own special purposes. He made a covenant of love with Israel (Deuteronomy 7:6 – 8). Throughout history, God has honoured His choice of Israel, and He has been completely faithful to the covenant that He made. It is a priority with God that every other nation should respect His choices and learn from Israel’s example. It is recorded in 2 Kings 5:1 – 4 how God healed Naaman, a Syrian commander, even though Syria was and ancient enemy at war with Israel… “And Naaman, commander of the army of the king of Syria, was a great and exalted man with his master, because Jehovah had given deliverance to Syria by him. He was also a mighty man, but a leper. And the Syrians had gone out by companies, and captured a little girl out of the land of Israel. And she waited on Naaman's wife. And she said to her mistress, I wish my lord were with the prophet in Samaria! For, he would recover him from his leprosy. And one went in and told his lord, saying, this and this said the girl from the land of Israel,” 2 Kings: 1 – 4. In those days, Syria was the dominant military and political power of the region. Namaan was the general who was instrumental in bringing his country into prominence. He was chosen by God for greatness as a general, but also for much more! In spite of being a great general Namaan had an incurable disease… he was a leper. His Israeli servant girl loved her master and wanted to see him whole. She told him of a prophet in Israel with a power to heal. So, Namaan was sent by his king to seek healing and eventually he arrived at the house of the prophet Elisha; 2 Kings 5: 9 – 12. 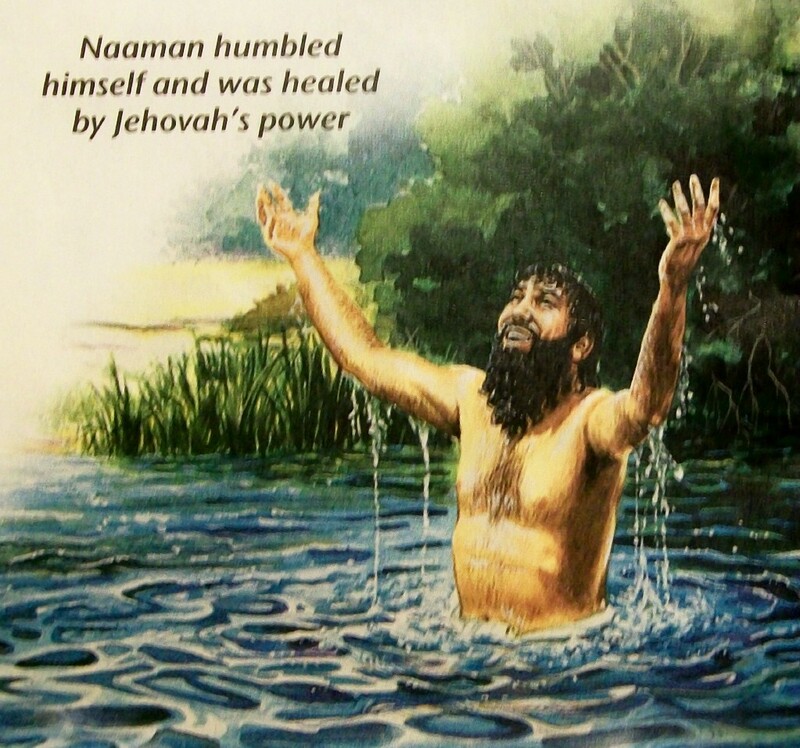 Namaan was now wiser to also understand that God was in fact speaking to him through his circumstances and realized that it was not just a minor local God that healed him… He knew it had to be the God of all the earth and furthermore realized that it was God’s choice to heal him in a particular place. When he came to Israel and dipped in the Jordan, he humbled himself to accept God’s sovereign choice of the Jewish nation. The miracle of his healing in turn brought him revelation of God, and of God’s particular choices. We cannot understand God’s mercy toward Israel today without looking at the extent to which the Jews have suffered as God’s chosen people… Have you ever thought about the fact that our access to the knowledge of God and creation are mediated by the story of Israel? Both the God we know (He’s known as the God of Abraham, Isaac, and Jacob) and the world He made are told through the story of His chosen people, Israel. In fact, Israel’s unfolding drama reads as the story of one nation that God has chosen to play the role that God had first assigned to humanity as a whole. Simply put, the story of humanity is the story of Israel. The preservation of Israel as God’s people is an important testimony to God’s covenant faithfulness. Many times in history, Israel’s enemies have risen up to destroy the Jewish people. It seems that whenever God is about to do something significant with His people, disaster threatens them. We are facing turbulent and dangerous times, not only here in Israel but around the world. At the core of the turbulence… there is a bitter hatred for Israel and the Jewish people! The city of Damascus is the capital of Syria. It is a large prosperous city with modern amenities and an ancient history. Damascus is one of the oldest inhabited cities in the world. It was founded by the Aramaeans over four thousand years ago, and was inhabited two thousand years before that. Damascus is a living depiction of human history. Today Damascus is dying…! Keep an eye on Syria after Assad goes…! First they’ll come for the Alawites… then the Christians... There’s a real chance that all traces of Christianity will disappear from the very place where the Apostle Paul was knocked off his horse and blinded by a vision of the risen Christ. What will happen when Assad falls from power…? Assad has made powerful allies during his tenure – most notably Iran and Russia. There’s always the possibility that Russia and Iran (both of which have troops and advisors aiding Assad inside Syria) might step in to keep Assad in power. This scenario seems unlikely given the international outcry this would cause. Then again, has international outcry stopped Iran or Russia before…? If Russia and Iran aren’t able to keep Assad in power, will Syria then become a peaceful Western-friendly democracy? NO! The United States has neither the patience nor the political will to create a sustainable democracy in another Middle Eastern nation. Radical elements of the rebel opposition have too much sway. Syria will go the way of Egypt – another large Arab nation in the hands of a Muslim Brotherhood-like regime. For the West, they are left with two impossible scenarios… the continuation of a vicious dictator backed by Iran and Russia or a radical Islamic takeover of another Arab nation. Russia is very worried over Syria, and there are reports they are docking in Lebanon. The rumour is Syria and Russia are very disturbed by Lebanon's behaviour, and they want to teach Lebanon a lesson. There are reports chemical weapons have already been distributed among Hezbollah in Lebanon which is a Russian ally, Syrian infiltration of the Golan Heights with either by the Syrian armies or by rebels is reported possibly imminent, so Israel has beefed up its northern security, to possibly quell any unrest. Al-Watan, quoting unnamed sources from the Syrian opposition, reported that Syrian President Bashar Assad has been transferring weapons to Hezbollah since the beginning of 2012, including two tons of mustard gas and long-range missiles capable of carrying chemical warheads and travelling 300 kilometres. The Syrian opposition sources also claimed that the transfer to Hezbollah lasted 40 days, from mid-February to March 2012, the Saudi Daily reported. The chemical weapons transfer to Hezbollah was carried out under the supervision of a senior Syrian officer of Assad. For Israel, Syria’s leadership change may help initially as Assad is no friend to Israel. In 2011, he paid protestors to storm the Israeli border in an effort to take the international eye off his rebel slaughter. It worked as western media outlets, thirsting for a chance to make Israel look like “occupiers” and “oppressors” took the bait. For a few days Israel was in the media focus as Syrian protestors died trying to breach the Israeli border. Should Assad lose power, the radical elements of the rebels will likely be anti-Jewish, much like the Muslim Brotherhood. Even in the hands of radicals, Syria poses a minimal threat to Israel. Israel has defeated them in four wars over the past 70 years. They could certainly do it again! Will Assad fall from power? Or, will his allies seek to keep him in power? We shall soon see. Either way the Russians and Iranians will want to keep their influence in Syria for events in the future. As God is preparing the world for future events, it’s always a good idea to keep an eye on the chaotic Middle East. Damascus is the capital of Syria and its second largest city, with about 2.6 million people in the metropolitan area. Today Syria is in the midst of a civil war. There is a movement to oust Syrian President Bashar Assad. While most Syrians support the more westernized Assad, Islamist factions led by the Muslim Brotherhood are fighting for control of the country. Today Syrian rebels along with defecting military personnel and foreign jihadists are fighting the Syrian army near and in the city of Damascus. 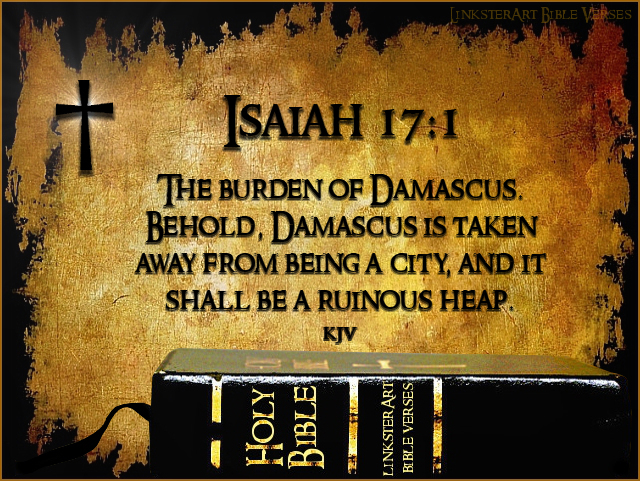 Damascus has already suffered a great deal of damage, but according to Isaiah 17: 1 …Damascus will be taken away from being a city. And today, fighting in Damascus is on the rise! World governments are scrambling… The UN and US leadership want Syrian President Assad gone! There are rumours that the CIA has been smuggling weapons to the Muslim Brotherhood in Syria. However, Russia and Iran want Assad to stay. The US is pushing for Middle Eastern led military action. The US, UN, Britain, France, Saudi Arabia, Turkey, and other world powers are pushing for an escalation of force to oust the Syrian President. At this point people are reaching the consensus that the Rebels will eventually overtake the Syrian army. The key to victory is a capture of the seat of power in Damascus... However, rebel fighters say that they do not have the military might to take Damascus. Turkey has deployed many troops and heavy artillery along the Syrian border. NATO has deployed several Patriot missile batteries as well. The missiles are manned by 400 US soldiers. It looks like foreign military force will be brought to bear at some point. 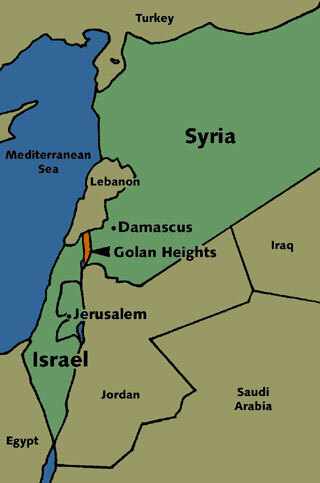 According to Old Testament Prophets Isaiah and Jeremiah; Damascus, Syria will be destroyed. Syria has been fighting for the past two years, in the midst of a civil war. During that time Damascus has suffered some damage, but has been mostly spared. That seems to have changed now. Over the past weeks bombings and destruction have found the city of Damascus. Damascus today is a refuge to Palestinians, Iraqi Christians, and civil war fleeing Syrians. Some three million Syrians have been displaced. Over 700,000 have gone into foreign countries. Hundreds of thousands had taken refuge in Damascus. Now Damascus is fleeing…! According to Jeremiah Damascus will flee in fear. That day is here! Tens of thousands of Damascus residents are now fleeing the city! Bible prophecy is unfolding! Notice in the scripture (Jeremiah 49:23 - 7) that the Syrian Army will be left in the city then the city will be destroyed. In verse 27 “kindle a fire” means that God will send an army into the streets of Damascus. It won’t be surprising that the Turkish Army along with the Free Syrian Army will invade Damascus, and after the destruction of Damascus these armies may turn south for an invasion into Israel! By the destruction of one of the oldest cities in the world God is telling us that he is about to dramatically intervene in human history… The final Gentile world empire is about to be created, Israel is about to be tried, and Yeshua HaMashiach (Jesus Christ) is about to take his world throne in Jerusalem! 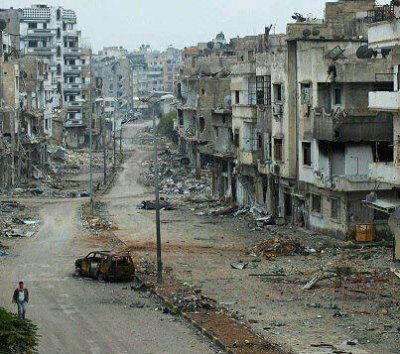 The Road to Damascus… destruction…? Once upon a long time ago, the Hebrew prophet Isaiah predicted that the Syrian capital city of Damascus would someday cease to exist. Isaiah, whose prophetic ministry spanned between 740 – 701 BC declared that it would be reduced to rubble. Some scholars believe this prophecy found fulfilment around 732 BC, shortly after Isaiah predicted it, when the Assyrians conquered Aram. Aram was the ancient name for much of modern day Syria. But if it was fulfilled then, why did Jeremiah predict a similar scenario over a century later? And, why did Isaiah mention Assyria 37 times throughout his 66 chapters, but never once mention it in Isaiah 17. For instance Isaiah 8:3 - 7 clearly identifies an Assyrian conquest of Damascus. This found fulfilment in Isaiah’s lifetime. BUT, Damascus still exists today! Since Damascus survives today as Syria’s second most populated city behind Aleppo, it demonstrates that Damascus never entirely ceased to exist. Therefore, if Isaiah intended his prophecy to be interpreted literally, it remains an unfulfilled prophecy! The relevant passages concerning the future of Damascus are located in Isaiah 17:1-14 and Jeremiah 49:23-27. To be sure, Isaiah 17 is a frightening prophecy since it means we will witness the shocking end of Damascus, a famous capital city along with the millions of people living there (and in other targeted cities). But after full consideration, perhaps the scariest part about it is what it means for the rest of the world. When it’s over one of the last major prerequisites in Bible prophecy for the start of the Great Tribulation will be met and the “beginning of sorrows” Yeshua (Jesus) spoke of could commence next. The Hebrew word used for “forsaken” is “azab,” and means abandoned, withdrawn, left behind, released, or neglected. Since these cities eventually become agriculturally zoned “for flocks,” the best understanding is probably that the destruction of Damascus necessitates the withdrawal of the surrounding city populations, which ultimately leads to their release and rezoning. Parson’s Bible Atlas, lists three possibilities for “Aroer”… Aroer Judah; Aroer Sihon; and Aroer Gad and of the three Aroer, Gad becomes the likely option, because it was located nearest to Damascus. Amman, Jordan is within the area of ancient Aroer Gad, and is where most Jordanians live today. Damascus is located in southern Syria, and the Jordanian capital of Amman is in northern Jordan. Only 109 miles (175 km) separates the two Arab capitals. Aroer Gad was part of the tribal territory of Gad. Numbers 32 informs us that the tribe of Gad was generally agriculturalists and as such, Gad (one of 12 tribes of Israel) requested this territory because it was suitable for his sizable flocks. Thus, the destruction of Damascus apparently spills over into northern Jordan… and probably finds a prophetic connection with Jeremiah 49:1 - 2. If it does, this may suggest that Israel is responsible for the destruction of Damascus. Israel’s Nightmare Scenario… What if someone else decides to attack Israel? What if the anti-Israeli powers take advantage of Syria’s chaos by implementing an invasion of Israel… from Syria? The Iranians and Russians have considerable sway in Syria. They may shirk at seeing a new Syrian regime unfriendly to them. Seeing their embattled dictator on the verge of receiving the Gaddafi special, the Russians may decide to rescue their man. While they are “rescuing” Assad, perhaps the Russians and Iranians decide to keep a strong peace keeping force in Syria? They would only be a stone’s throw away from the gates of Israel… Therefore, Israel’s worst nightmare would be Iranians, Russians, and Turks invading with their masses into Jerusalem. There are troubling reports that Syria has used chemical weapons already against their own people during March. Our hearts and prayers go out to the people of Syria as more trouble is on the way. God does not sanction the atrocities, His heart goes out to the people, and He wants them to come to salvation in Him. 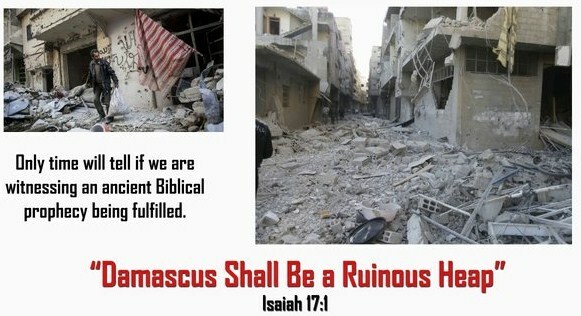 God warns us in Isaiah 17 that man WILL destroy Damascus some day. It is not that God is giddy about the destruction… but He is warning us that this that will happen will signal we are a step closer to His Coming as man's actions will only get worse. He cries what man is doing to his fellow man! Why Israel would “nuke” Damascus…? Israel has long had an arsenal of nuclear bombs and is also a frequent target of attacks from Syria (and the terrorist organization Hezbollah in Lebanon). In fact, Israel has already been in several major wars with Syria between; 1948 to 1973. Importantly, Israel also has the will to use these weapons… if threatened! 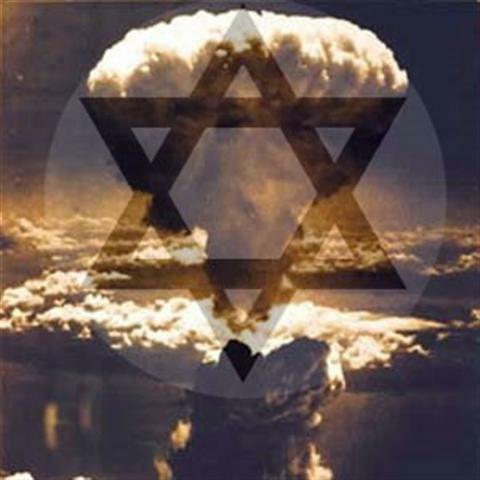 Because Israel's enemies are so numerous and able to overrun the tiny nation so easily, Israel has adopted a nuclear policy called “The Samson Option.” The name comes from the famously strong judge of Israel who took his own life by knocking out the support pillars of the temple he was in to avenge himself on his enemies around him. 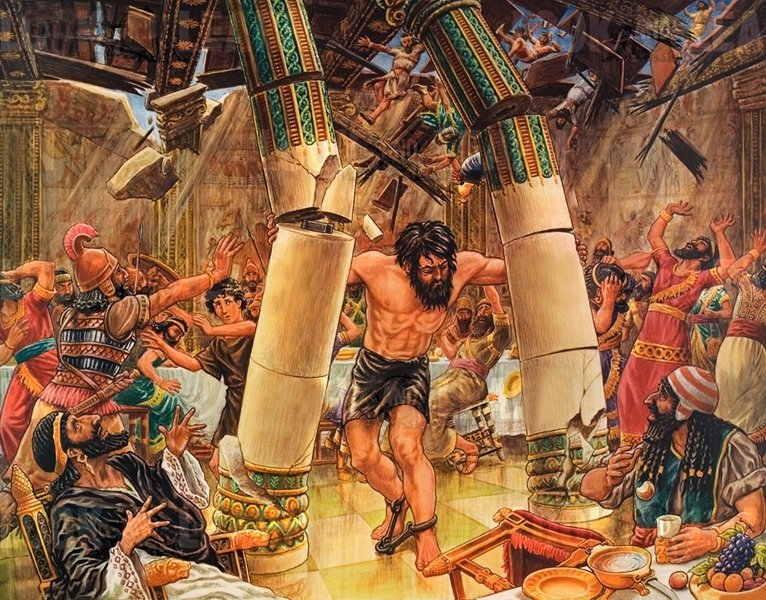 In the Old Testament Book of Judges, chapters 13 through 16 we read the story of Samson who literally brought the house down on the Philistines and killing them ... as well as himself choosing death over slavery. Through his courage Israel was saved! The slogan “Never Again” was adopted as the motto of the JDL (Jewish Defence League). The meaning of JDL’s motto… “Never again,” may not be that clear to those who do not know a lot about Israel Defence Force. “Never again,” means first and foremost that Jews will “never again” go quietly and submissively to their deaths. “Never again” means that Jews will not bend to the will of oppressors. “Never again” is a motto shouted with the recognition that Jews are not commanded by God to be downtrodden and victimized… quite the opposite. Never again is the motto of the post-Holocaust truly sensible Jew, who knows that the world can be a dangerous place and that it often gets much more dangerous for Jews when they fail to assert their rights as human beings. 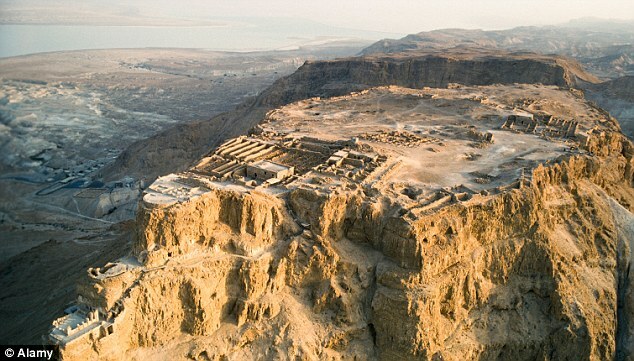 Masada is one of Israel’s greatest and most inspiration sites for the Jewish people of Israel... It was on Mount Masada that 960 Jews held off the Roman legions for three years before committing suicide rather than surrender and submit to Roman rule. But, how Does a City Become A Ruinous Heap…? If you think about it, this prediction is perhaps without precedent in modern times. To be sure, there have been several modern cities that have been merely abandoned. A famous example of this is Pripyat, Ukraine. Probably that name does not ring a bell, but this is the city where the famous Chernobyl nuclear reactor leak happened. Due to the radioactive fallout, it was deserted as a ghost town. Decades later it is only safe to visit for short periods! However, for a modern city to end its run and become an uninhabited pile of ruins IS something unprecedented. For example, Hiroshima and Nagasaki, the targets of the first atomic bombs… continue as cities to this day, despite having been partially levelled from the atomic blast. The reasons for this are twofold; the first two atomic bombs used on Japan were on the small side by today's standards. Secondly, the bombs were detonated high above the cities, in what is called an “air burst.” Air bursts produce greatly reduced fallout levels compared to ground strikes. This makes it feasible to rebuild and re-inhabit the area, just as Japan did. Damascus’ fate is different… than either of these cities or perhaps any other. Its buildings and streets will not just be deserted, BUT they will be left as a “heap of ruins.” We are not aware of a case in modern times of that happening to a city. There are cities that have been wiped out by tsunamis or even volcanic explosions, but they have been rebuilt and not left as heaps of ruins. Perhaps this scenario of Hiroshima and Nagasaki provide the closest concept for how Damascus' complete destruction and abandonment is likely to happen. A nuclear bomb with a larger yield or a series of bombs with smaller yields could turn an entire city to a heap of ruins... This is quite feasible in Damascus’ case since it is small, only approximately 40 square miles in area. If a ground burst attack is used instead of air bursts, the strong fallout would keep people from coming back to rebuild and re-inhabit it. What has to happen first is revealed in another prophecy. In Psalm 83 by Asaph – (2 Chronicles 29:30) we are given another view of this same war that brings Damascus down. Like Isaiah 17 it predicts a devastating defeat for Israel's attackers! Just like Samson’s action against the Philistines was a last resort… Israel's Samson Option is a protocol of last resort, which involves Israel's sizable nuclear arsenal including nuclear armed submarines with a devastating nation killing second strike capability. The Arab and Muslim world, including Iran and the USA, UN, Russia and EU should understand that Israel reserves the right to retaliate… and they have the capability of retaliating - if attacked… even if they are the recipients of a devastating nuclear attack from Iran or chemical weapons from Syria. The Arab and Muslim world should understand that if they issue a “nuclear death warrant” against Israel… they will have signed “their own nuclear death warrant,” as well. There can be no question that Israel will retaliate… and the country of Iran or other Arab Muslim countries will no longer exist as a viable nation or state. Going further in the prophecy of Isaiah 17:12 - 14 we can see that, Syria will not be acting alone against Israel: “Ah! The roar of many peoples… they roar like the roaring of the seas. The raging of the nations… they rage like the raging of mighty waters. In the evening… sudden terror! Before morning… it is gone! Therefore the description fits yet another Middle East war where Israel is attacked by her mainly Arab and Islamic neighbours such as Syria, Lebanon, Egypt, Jordan and probably also Iran (who is not Arab). Yet, like before, Israel will be victorious… and quick. Notice that… it takes only from one evening until the next morning to achieve decisive victory! It sounds just like the “Samson Option” after Israel is left with no choice but to use her nuclear weapons against multiple enemy nations and cities. Their armies will literally be gone, not to mention a large segment of their civilian populations. No wonder Isaiah says that the situation shifts overnight from terror for Israel to tragedy for her enemies. As the world is now pushing Israel into a peace treaty, it is more evident now than ever the prophecies of old are happening all around us. Nations are abandoning Israel, Christians are abandoning Israel and you can already feel the change in the air, and Satan is readying to make his next move. We know as Christians God is one step ahead, and He is in control!